Welcome to the class cameras. The JVC HM-150U. We have 10 of these cameras available for use throughout the course. 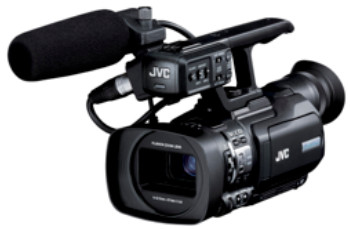 This in class introduction to the cameras will get you started in using these professional recording devices. Here is a copy of the camera note sheet. Complete as many "feature arrows" from the link above. The rest will be discussed during the in-class demo. Really want to know more? At home and have a question about the cameras? Follow this link to the 140 page instruction manual provided by JVC.